(Baltimore, MD) - Mel Gibson’s The Passion of the Christ shows us graphically the depth of the suffering Jesus endured for us. Indeed, the enormity of Jesus’ sacrifice, reflected in His violent beating, scourging, and crucifixion, is literally breathtaking. However, it is important to keep in mind that Jesus not only died for us, He also lived for us. Despite living the most stressful life in human history (imagine having the redemption of humanity on your shoulders) Jesus was the most integrated and peace-filled person who ever graced our planet. His life is a model of how to think, feel, and act to live a life of deep and abiding significance. 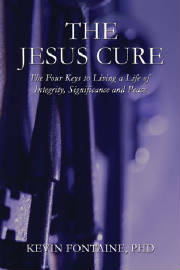 In his new book, The Jesus Cure: The 4 Keys to Living a Life of Integrity, Significance, and Peace, published by PublishAmerica, Inc., Psychologist and Christian writer Dr. Kevin Fontaine describes the 4 characteristics that made Jesus the most integrated and peace-filled human to ever live. Drawing upon scripture, personal experience, and contemporary culture (including the terrorist attacks of September 11, 2001), Dr. Fontaine argues that the remedy for our moral decline is to embrace and imitate the model human life that is Jesus. In a world spiraling out of control with violence and callousness of every description littering our TV screens, computer monitors, and newspapers each day, we need to find some way to manage the burden, the stress, and the turmoil so our lives are not wasted living in fear and apprehension; but are marked by peace, joy, and contentment. In many ways it was inevitable – for God didn’t want mindless robots, He created us in His own image – He gave us free will – choices – He made us decision makers. Although His greatest desire was for us to submit to His will and thus enjoy eternal abundance in His presence, He would never force us to do so. Sadly, the decline of our civilization associates almost perfectly with the ascendancy of moral relativism. How could it be any other way? When right and wrong are no longer clear but malleable and negotiable based on what I believe is true for me you literally have carte blanche to do whatever you damn well please. Order online with SECURE shopping cart at Publish America or call (301) 695-1707.